Take your color mixing to the next level with the FlatPar6 "low profile" LED fixture. 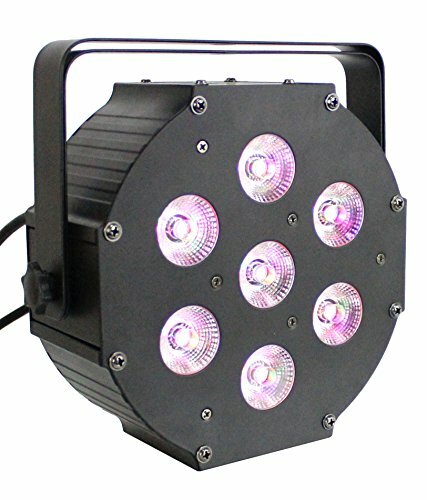 It features seven 6 in 1 LEDs ( RGBAW+UV) with smooth color mixing as well as a true amber, white and UV LED to get the hard to achieve colors you want. The units "low profile, " sideways power & DMX Ins/Outs and dual hanging brackets make it ideal for mobile entertainers, permanent installations and for inserting into truss or for up lighting. Snoot frame is included to help limit unwanted light exposure. The Flat Par has 9 different DMX channel modes and may also run in Sound Active or Master/Slave modes. Users can also go "wireless" with the ARTIC Liberty wireless (sold separately). This LED fixture also features: Color Macros, Electronic Dimming (0-100%), AC IN and OUT on rear to daisy chain power. The Flat Par are rated at 50, 000 hours and only draws 60-Watts of power per fixture. If you have any questions about this product by ARTIC, contact us by completing and submitting the form below. If you are looking for a specif part number, please include it with your message.